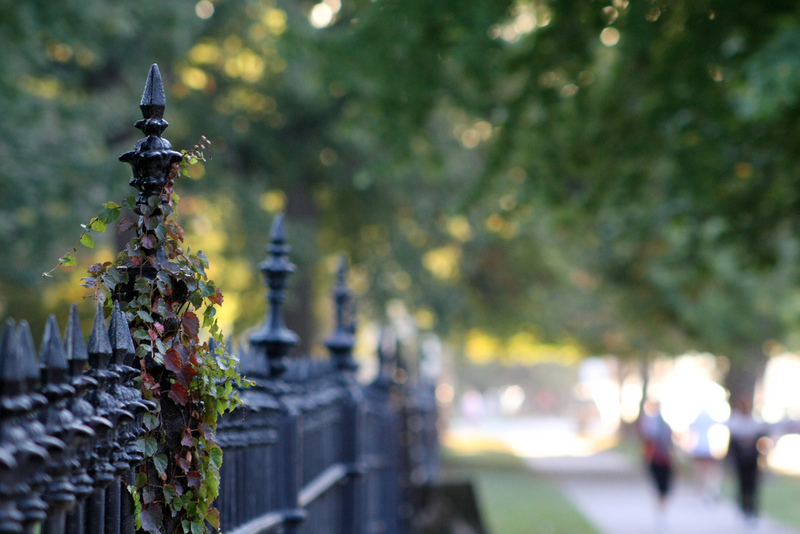 Anytime I’m in St. Louis, my hometown, a visit to the historic Lafayette Square neighborhood is high on my to-do list. While I lived there for a few years, my wire fox terrier, Dash, and I would travel twice each day from our loft apartment in a renovated, red brick, shoe factory, past grand Italianate manors and restored Victorian row houses, to a handsome mid-19th century city park—the oldest in the Louisiana Purchase Territory. Paved pathways meander through 30 acres of enormous shade trees and lovingly tended flowerbeds, past a gazebo and fountains, and over a graceful bridge, all sheltered within the protective embrace of an original cast iron perimeter fence. There’s even a lake, which serves as a harbor to a small flotilla of Canada geese (Branta canadensis), mallards (Anas platyrhynchos), a scattering of former Easter ducklings—and what Victorian-era water-feature would be complete without a few imperious mute swans (Cygnus color)? The park is a hub of activity in afternoon and early evening. Muffled traffic noise seeps in from the surrounding streets, mingling with the squeals of kids blowing off steam at the playground, friends chatting as they walk, flag football players shouting audibles, or a crowd cheering at a vintage baseball game (depending on the season). Fiercely determined joggers make their appointed rounds. Dogs check messages on trees and shrubs while their humans check messages on smartphones. Families gather around picnic tables and grills, young lovers canoodle on hand-me-down quilts, sometimes wedding rings are exchanged, and there’s the occasional free open-air concert or movie night under the stars. Most mornings, though, Lafayette Park felt like my tranquil private garden. GPS may have pinned my location as adjacent to a bustling downtown, but the dappled stillness of this urban oasis, complimented with the music of dancing water and splashes of birdsong, set an unhurried tone. By the end of our walks, I was ready to step off of the 19th-century cobblestones into my 21st-century life and onto the Information Highway. I left St. Louis, yet again, about 18 months ago, and returned to the Virginia Tech campus in southwestern Virginia. However, recent #Metoo news stories about the power of women, when they choose to claim it, keep calling to mind a specific memory of my favorite municipal park. During a dawn stroll around the park lake in late spring, I spotted a slim solitary figure standing still as a statue at the water’s concrete edge. My sighting wasn’t due to any exceptional powers of observation; a great egret (Ardea alba Linnaeus) doesn’t exactly blend in with the surroundings. There’s simply no point in trying to avoid detection when you’re a 3-foot-tall bird with a serpentine neck, clad in your breeding season best: extravagant lacy white plumes, a saffron bill, lime-green lores, and long, jet-black legs and feet. My heart leapt—not because the bird was beautiful (although it was), and not because I didn’t yet have one on my life list (I’ve seen many). No, it was spotting a great egret in this place that brought tears of joy to my eyes. When Lafayette Park was first dedicated, in 1851, it would have been a rare spectacle indeed to see those elegant courtship aigrettes on anything other than a lady’s hat. 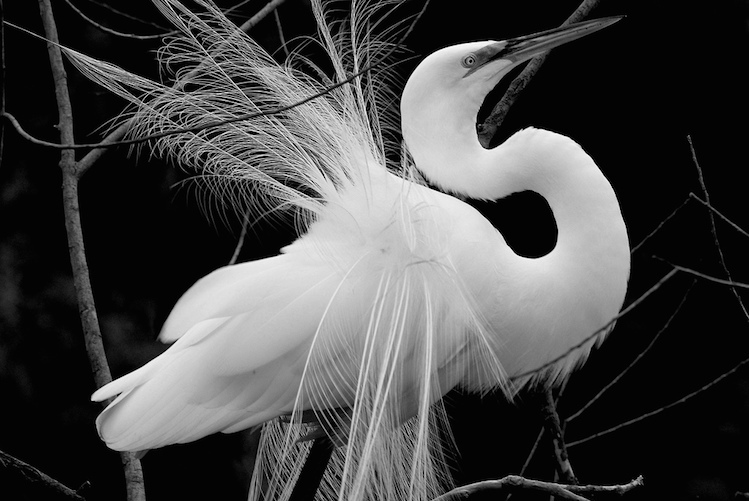 Great egrets were hunted almost to the point of extinction to satisfy fashion’s dictate that a proper, self-respecting adult female must never be seen in public without a pile of millinery fabric, lace, ribbons, flowers, bird feathers and body parts balanced on her head. Egret plumes, in particular, were all the rage. Women were the drivers of this deadly demand, so it’s particularly fitting that women played such a crucial leading role in creating the fledgling U.S. conservation movement of the early 20th century. Boston Brahmin socialites Harriet Lawrence Hemenway and Minna B. Hall organized tea parties to create Audubon societies for the protection of birds. Word spread, and additional groups formed in more than a dozen states. 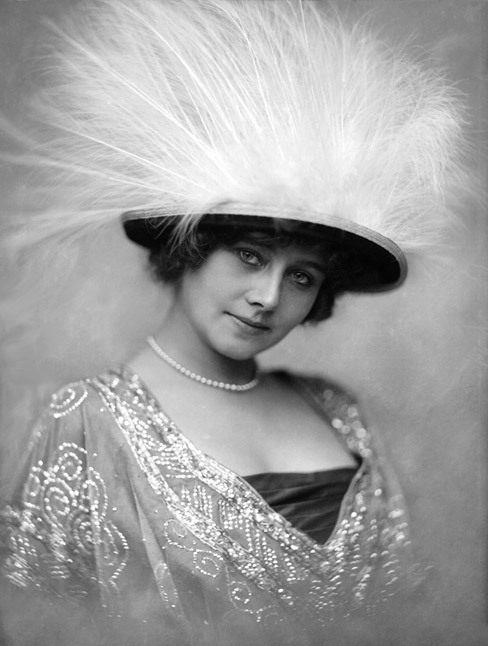 Concerned women encouraged and prodded female friends, family, and acquaintances to pledge a boycott of hats with birds or bird plumage. The Migratory Bird Treaty Act (MBTA) of 1918—a convention between the U.S. and Great Britain (on behalf of Canada) that prohibited pursuit, capture, killing, and selling live or dead migratory birds, their parts, feathers, eggs, and nests. The MBTA is still enforced today and, by any measure, has been a spectacular success. Many species on the verge of extinction 100 years ago—including trumpeter swans (Cygnus buccinator), snowy egrets (Egretta thula), and eastern willets (Tringa semipalmata semipalmata)—are now doing quite well. 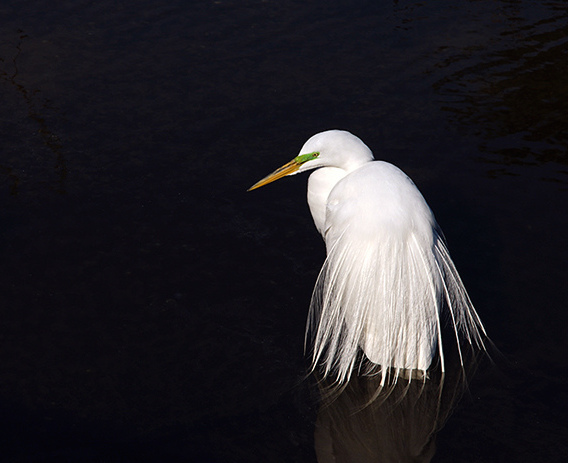 And while hats and “fascinators” are currently experiencing a small uptick in popularity after a decades-long fall from favor (thankfully, without the wild bird feathers that graced their predecessors), the numbers pale in comparison to the great egret renaissance. Although exact population numbers are hard to find, the species is now classified as “common,” numbering in the tens of thousands of breeding pairs, at minimum. On this particular morning, though, the park offered sanctuary to one solitary great egret, along with one noble wire fox terrier (Queen Victoria herself kept one as a pet), and me, the least pedigreed of the group. I spent a long moment contemplating the significance of this stately creature’s return to a historic Midwestern park perched near the Mississippi River. 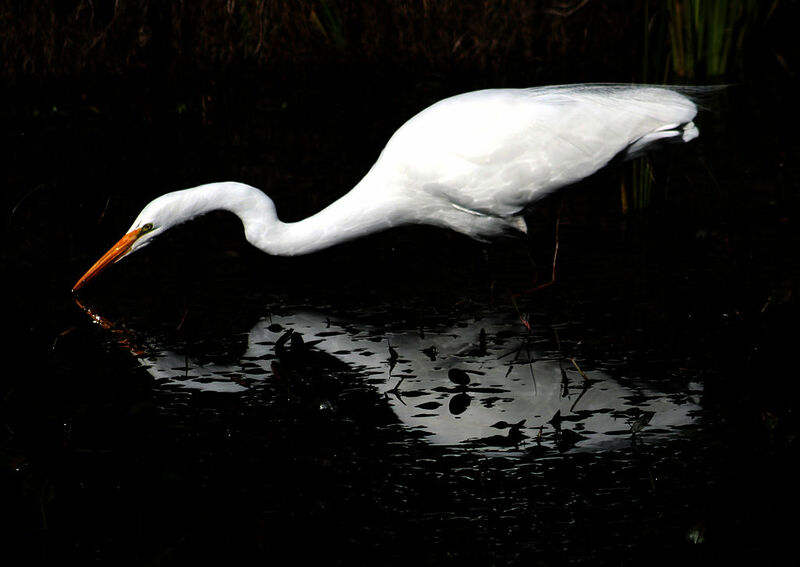 Standing at the intersection of past, present, and future, I watched as the bird gazed intently into the water, meditating on the play of liquid and light. Or, perhaps, something both deeper and more practical… like breakfast. Kieran Lindsey, PhD, is an urban wildlife biologist, co-author of Urban Wildlife Management (1st & 2nd editions), editor of the Journal of Wildlife Rehabilitation, periodic columnist for PCT Magazine, and the Wildlife Guru for NPR’s Car Talk. Kieran blogs about urban wildlife at nextdoornature.org.